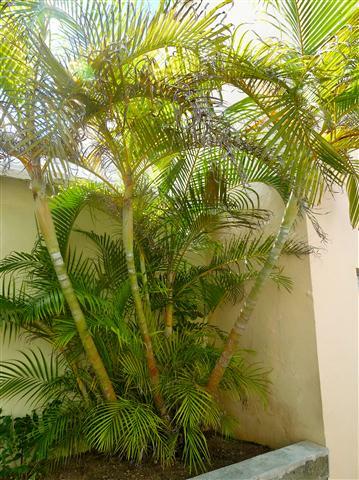 This article is about the Areca Palm, Dypsis lutescens, with discussion of its characteristics, cultural requirements, ease of growth, hardiness, use in the landscape and relationship to other similar palm species known as "Dypsis". Although sometimes difficult to find at a nursery, I've found this species to be very popular among plant enthusiasts. It is frost tolerant, doesn't get too tall, is very attractive and can be used in a variety of ways in the garden landscape. This article gives information about this species' natural habitat, morphology and appearance, cold and sun tolerance, cultural care and growth, and usage in the landscape. 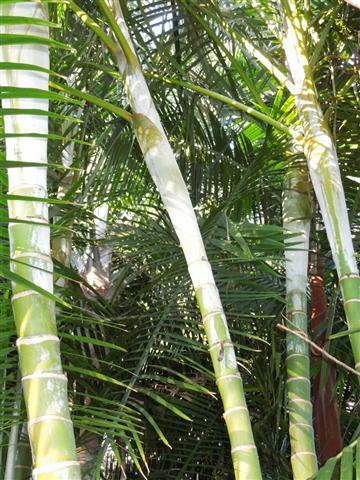 Comments are also made about other species of the genus Dypsis that can be utilized in the garden. I have written this article because there is so little descriptive information about this species in reference books or on the Net. 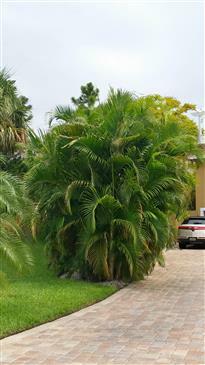 The Areca Palm is a clustering palm that grows in tropical to many temperate climate zones, gets a mature height of fifteen to forty feet, and has trunk diameters of two to four inches. All mature stems are more or less the same diameter with no dominant trunk when trunks are mature. But, individual stems of this species are of variable heights due to age of any given stem. Younger trunks can be quite short and tend to be on the outside of the footprint of the cluster. Nursery grown containerized plants may have a huge number of stems evident. Over time, many of these will die off giving about a dozen that remain as eventual trunks to a mature clump. 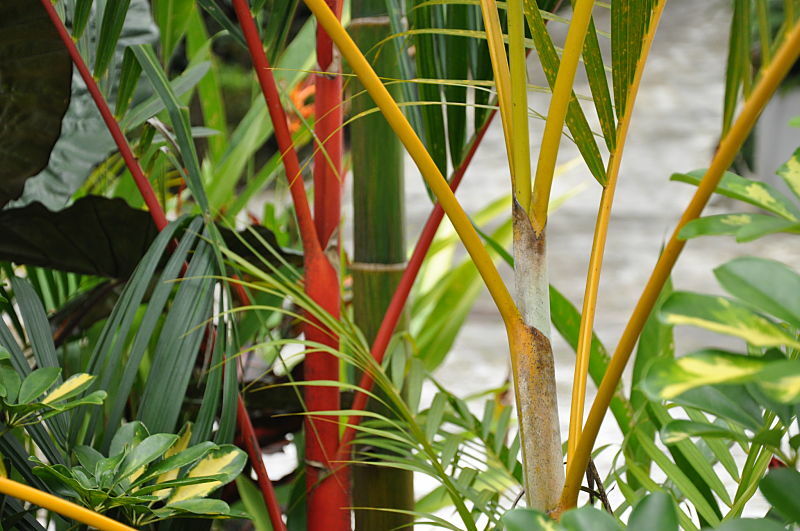 Plants grown in more tropical regions tend to be taller and more robust. The number of stems is also quite variable and can be controlled with pruning. Clumps seen in most areas typically have about a dozen stems or less, although mature specimens of just one trunk and as many as fifty are known to exist. 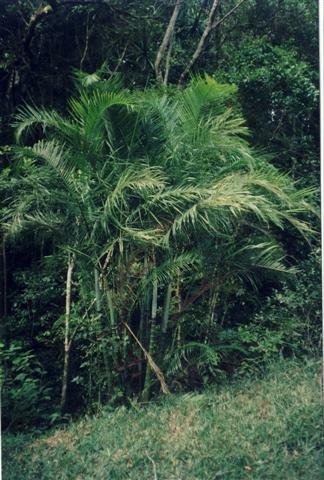 Overall height of mature specimens of Dypsis lutescens probably is determined most by 1) Age of the specimen and 2) Where the plant is being grown. In Southern California, well grown plants are typically under twenty five feet. The most common height is ten to twenty feet. But, in the tropics, specimens are around that are over fifty feet. In his book, The Palms of Madagascar, John Dransfield mentions trunk heights of one to seven meters. This size is more compatible with what I've seen of specimens here. 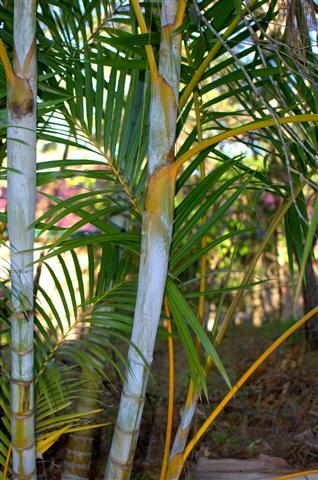 As we know, there are many species of taller suckering Dypsis in Madagascar. Also, we know that hybridization of species does occur there. 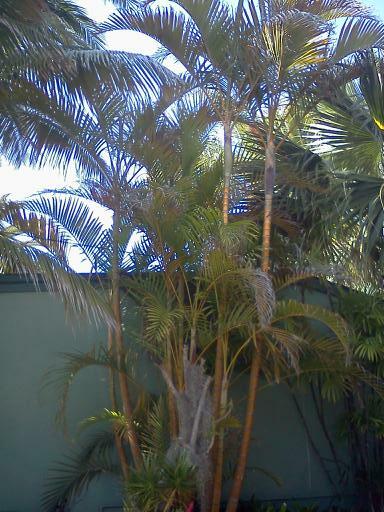 So, one might ask, "Is a really tall specimen of the Areca Palm actually a hybrid with another species?" This possibility does exist. I would admit that plants grown in warm, tropical areas in general attain more height than plants grown in temperate regions. Trunks are vertical and crown shafted. There can be a gentle arch to the trunks. Trunk diameter is typically about four inches, perhaps swollen at the base. They get a bit thinner toward their top, below the crown. Trunks are smooth with no fibers. Trunk color is variable, ranging from green to silver, with n occasionally silver-white trunk seen. With sun exposure, trunks develop a brown bark. This can appear in a spotted fashion with areas of colored trunk mixed with tan bark. The third photo demonstrates this. With no direct sun to the trunks, they can retain their green to silver appearance for a long time. Crown shaft color is variable as well, sometimes being green, silver, white and rarely yellow. There is often speckling of the proximal petiole and this can extend onto the crown shaft. The number of trunks in a mature clump is also quite variable. Clumps in California are typically numbered at a dozen or less. 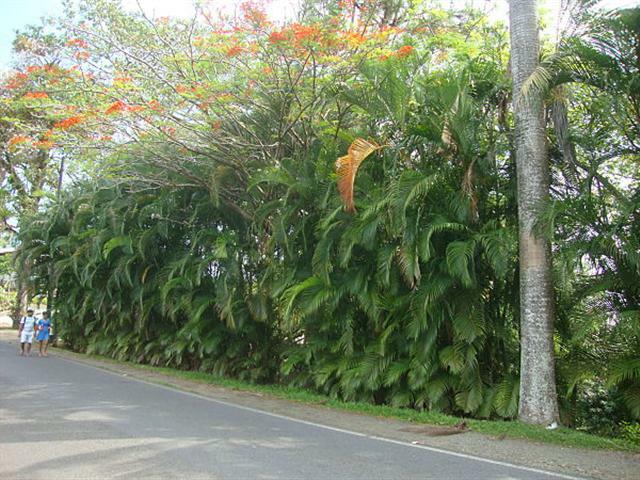 Mature clumps in the tropics can have up to fifty stems. Palm species that have multiple stems typically do this by dividing at their base and creating additional stems. 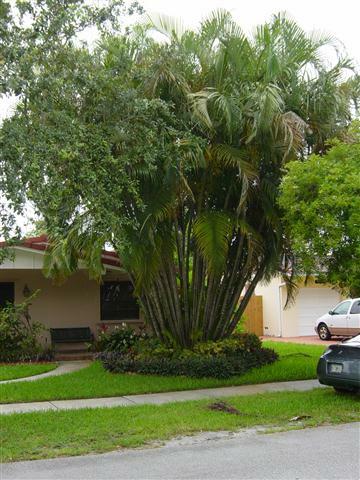 Palm species that have multiple stems typically do this by dividing at their base and creating additional stems. There is normally a primary stem and small outgrowths occur at the soil level. These start as new "plants", almost looking like a new seedling. They are not from another seed. They are vegetative additional stems from the primary stem. These mature and, although initially smaller than the primary stem, share all the morphological characteristics of the primary stem. These are known as "suckers" and would make such a palm a "suckering species". These suckers are attached to the primary stem by tissue. Contrast this with three individual, single stem plants that are put in the same pot. These are not attached at the stems and only have entanglement of the roots. If you look at the first picture below of a nursery plant, you can see, even at this young age, there are many suckers at the base of the larger man stem. An interesting thing about palms is that sometimes you'll see suckers form farther up on the trunk. They are not at ground level. I've seen this many times, especially with Dypsis. The second photo below shows you how a stem of Dypsis lutescens is producing suckers but they are located way overhead below the crown of leaves of a mature plant. In fact, I see three different suckers on this trunk. This interesting phenomena is known to palm enthusiasts. There is no logical reason I can think of why the plant would do this. Obviously, the point of attachment to the primary trunk cannot be as strong as a trunk in the ground. Also, this stem cannot form its own root system. Regardless, this does occur and I thought I'd mention it here. Sooner or later you'll see this on your own. Color of the leaves is green although hints of yellow, silver or even gold are evident in the leaflets and stems. From afar, there is no question that this species displays a fair amount of the color yellow. Leaf length is typically four to six feet long with a bare petiole. One typically sees spotting or specks of dark color near the base of the leaf stems. Leaves are pinnate and keeled, giving a "V shape" in cross-section. Also, this is a crown shafted species with the base of the leaf stems wrapping around the individual trunk to which it is attached. This wrapping around the trunk forms what is known as the 'crown shaft", discussed below. Crown shafted species are usually referred to as "self-cleaning". This means that the leaves fall off with age, bring along the entire leaf with its crown shaft. 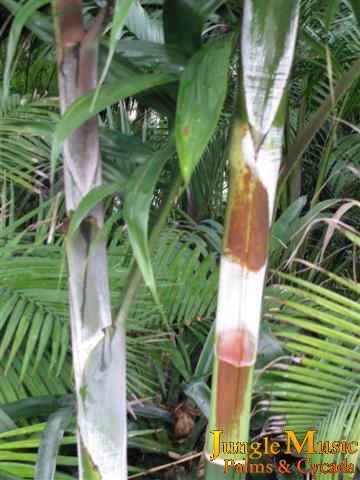 Areca Palm leaves, especially after experiencing hot and dry weather can show brown tipping to the ends of the leaflets. Cold weather can do this as well. Therapy for this is a simple "haircut" of the browned tips. It's quite amazing how this makes the plant look a lot better. Of note, the Butterfly Palm leaves look better with higher humidity. A crown shaft is a tubular structure at the top of the trunk of a palm, located just below the crown of leaves, that wraps around the trunk and is actually a modified base of the leaf. The base of the petiole expands out into a flat, cylindrical structure that wraps around the trunk. It can go all the way around the trunk or only part way. When an old leaf falls from the tree, the leaf base falls with it. The Areca Palm is a crown-shafted species. The photos below show these structures. On this species, the crown shaft can demonstrate a variety of colors. This can range from green to yellow to white. 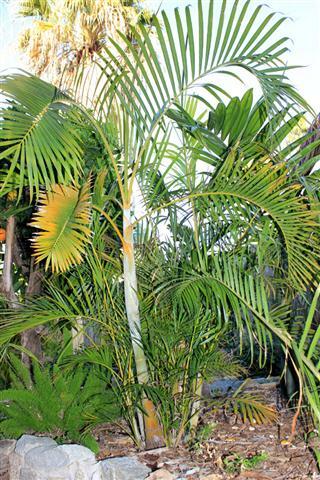 A "snow white" crown shafted specimen is sought after by palm enthusiasts. Of note, when you remove a crown shaft, another is evident right below the removed one and this crown shaft belongs to the next newer leaf. The number of stems that develop in a mature tree is quite variable. I think in tropical areas one tends to see more trunks, the overall color is more green, and the overall height is greater. So, in an area like south Florida or Hawaii, you might see several dozen stems. In contrast, plants in Southern California might only have six to twelve stems. Many gardeners don't like too many stems. They prefer a more "open look" and will prune off unwanted stems. This can be done to small new stems or to large existing stems. A plant with fifty stems typically would not have been pruned n recent times. If you compare the two plants below, you can see a huge difference in the number of stems. Yet, both plants are flowering, mature plants and similar height. As mentioned, the number of trunks is variable, from many to a few. Below is a picture of a single trunk specimen. It is not known if this is naturally a single trunk or if additional trunks were removed. Trunk height and plant size is quite variable, depending on how old the specimen is and where you are growing it. Above I showed a very old specimen from Brazil that is over forty feet. In California, the average overall height of the Areca Palm is fifteen to twenty feet. In containers, most plants don't get over eight to ten feet. Below are an assortment of pictures. Surprisingly, the plant from a hotel grounds in Hawaii is the smaller, but I suspect it's just a young plant. Dypsis lutescens is native to the eastern Madagascar where it is found in moist rain forest on slopes or along river beds. It is most common in sandy locations very close to the ocean. Dransfield in his book, The Palms of Madagascar, mentions that you'll see this species in rocky habitats and in secondary growth forest. 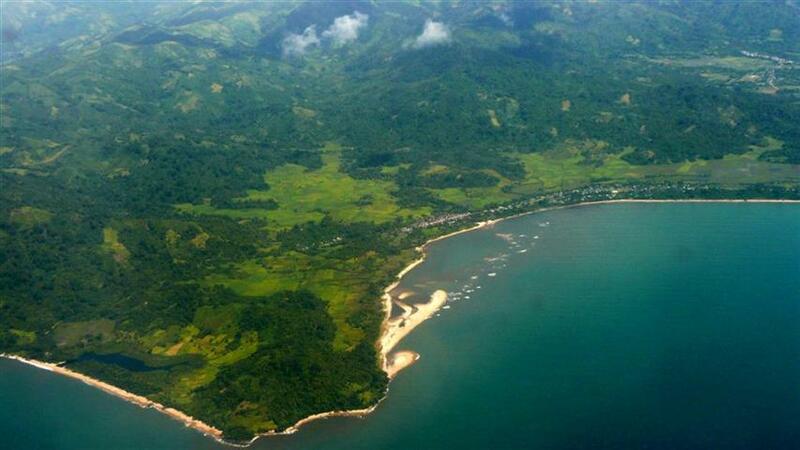 Because of the widespread habitat destruction on this island, the future of this species in habitat is threatened. 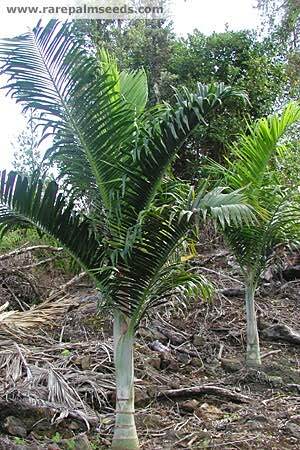 However, because of the worldwide distribution and usage of this palm, extinction is unlikely. Dransfield estimates that there are approximately one thousand plants left in the wild at the time of writing his publication. Of note, prior to his publication, this species was known as Chrysalidocarpus lutescens. 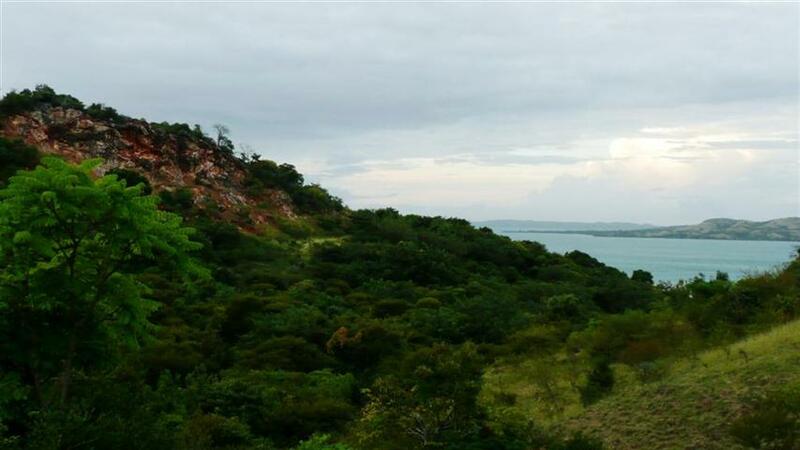 Photos below are of habitat areas in Madagascar. 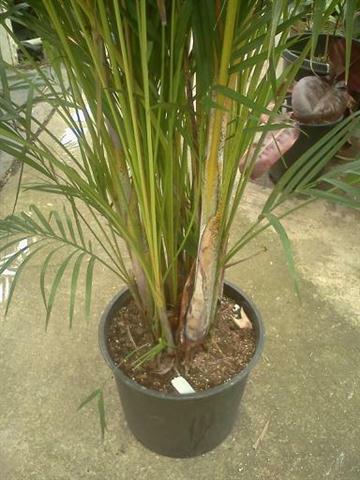 The Areca Palm is easily grown in tropical and subtropical regions. It flourishes in areas with sandy soil where water is ample and soil drainage is good. In such areas, it is most often grown in full sun but does quite well in part day sun or filtered light. It is not unusual for one to see this species adorning gardens in tropical regions or in hotel lobbies and patios. In general, in warmer areas, it tends to be more robust and get taller. Heights greater than thirty feet or higher can be attained. In coastal areas of Southern California, warm temperate areas like south Texas and in tropical regions, this species does excellent in full sun. This doesn't mean that it won't survive well in part day sun or strong filtered light. But, that it can withstand full sun. 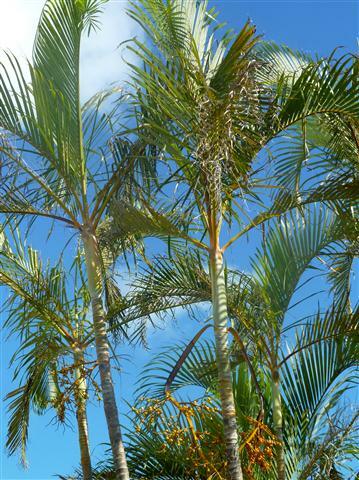 In areas like Florida or Pacific tropical islands, it is most common to see Dypsis lutescens in full sun. One would grow this species in a protected environment if he lives in an inland or desert area. For example, in Palm Springs, CA this species can be grown; but only in filtered light. One might find that plants grown in full sun tend to be more compact with shorter leaves, more on the yellow side, and on occasion pick up more leaf burn. 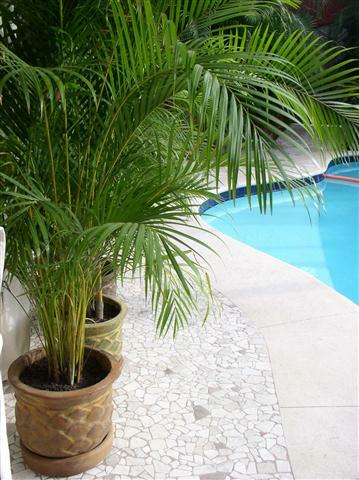 Like other species of Dypsis, the Areca Palm prefers good draining soil with adequate moisture. It likes heat and humidity and can tolerated some degree of dry spells. But, I would not consider it a xerophytic species. Dry conditions may give it leaf tip burn. People growing it next to a pool find that this tip burn is less and the plants enjoys the humidity. 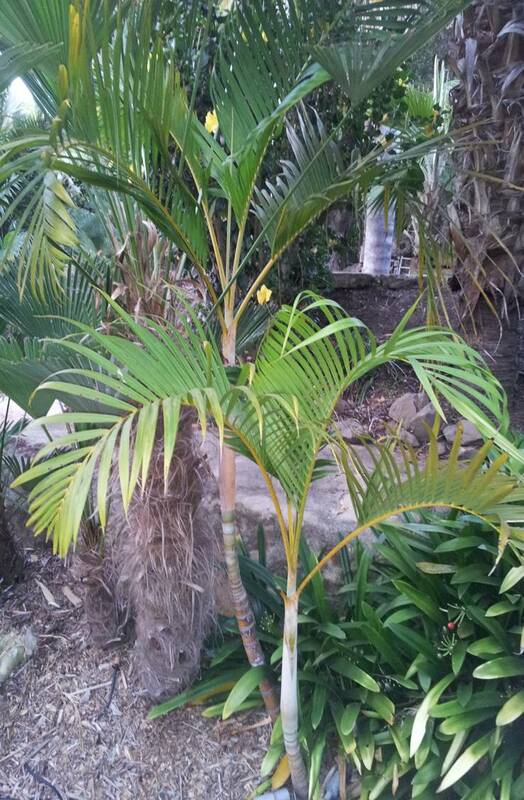 The Golden Cane Palm would be a poor choice for full sun in a desert environment. Cold tolerance of the Areca Palm is into the mid-twenties F. and perhaps even a bit lower. Specimens have been known to survive low temperatures of twenty-two degrees. But, it is not suggested for areas that will see temperatures into the teens. This species wants an N:P:K ratio of 3:1:3 or perhaps 3:1:2. 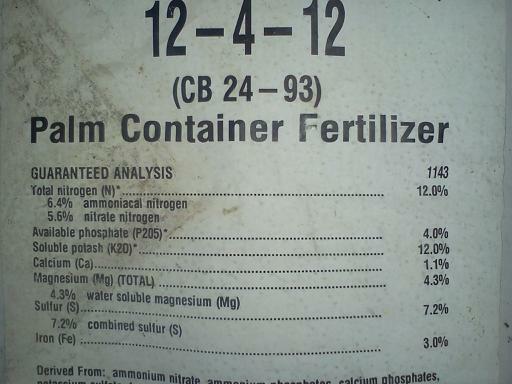 This would mean a fertilizer that says "15:5:15" or "12"4"8" would work well. We also suggest getting slow release fertilizer (safer to use) and a preparation with a good assortment of microelements. Availability of fertilizers varies from region to region and is totally different from country to country. So, you will have to seek out a preparation that meets the criteria above. A given named fertilizer available in our area might not be available in your locality. As mentioned above, it is possible to prune out suckering stems at the bottom to thin out a clump. This results in a more open plant where individual stems can be seen. This can be done early in the plant's life when overall height is not that great. Or, with more work, it can be done to a mature thick clump. It is advisable to cross cut stems of trunks to be eliminated about two inches above the ground. If you cut them below the soil line, rot can result and this could jeopardize the entire plant. When pruning leaves, one typically removes the oldest (lowest) leaves first. You would remove such a leaf by cutting as close to the trunk as possible but don't gauge into the crown shaft. Old crown shafts turn brown in color and should be removed when, without additional pruning, the can simple be "unwrapped" from the trunk. Premature removal of crown shafts can scar the trunk forever. 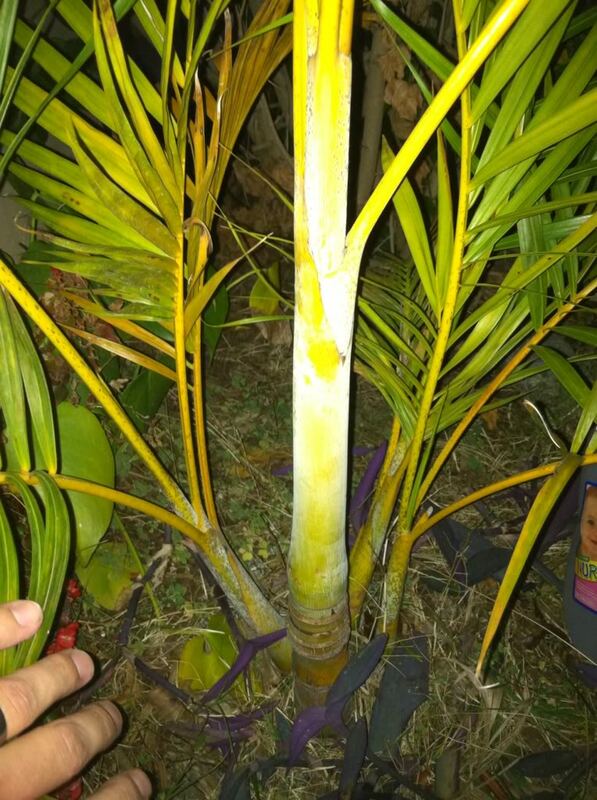 Below are two pictures of an Areca Palm that was pruned of lower suckers to result in an eventual mature tree with less stems. This is an aesthetic decision that the gardener has to make based on his preferences. On the second picture look how more open it is and you can easily see individual trunks. actually see through the plants. At our nursery, customers often come in with the goal of blocking visibility into their yard. This is particularly true when your neighbor has a two story house with a window right above your pool. 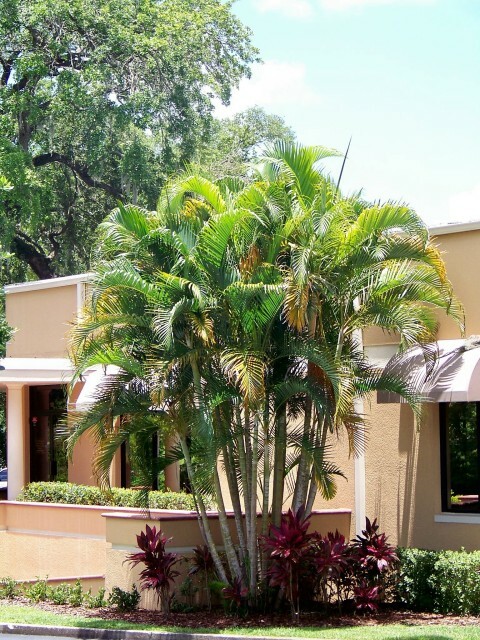 Because of this common request, the Areca Palm is the most common choice to create a botanical barrier to stop other people from looking into the yard. Properly placed, this species can make a fairly thick clump that is not easily looked through. In the first photo I have shown multiple plants lined up in a row. You can see it's difficult to see through them. The next photo below shows you some young plants. With age these will mature with more canes and density. 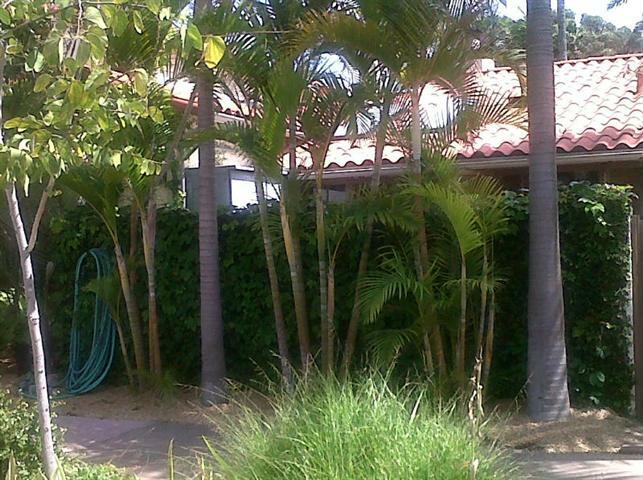 The final photo shows a mature botanical fence made out of the Areca Palm. It is a total obstruction to view through this green wall of foliage. Another interesting application for this species is utilizing it in a thin area such as a parkway or along a thin garden to the side of a house. 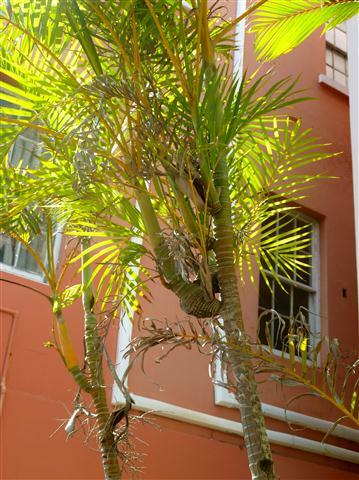 Larger palm species like the Queen Palm, Date Palms and King Palm just won't work in small planter areas. If people are walking nearby, you certainly don't want to use species with spines such as the Pygmy Date Palm. But, the Areca palm can work well in such an area. If one properly prunes off new suckers, he can limit the number of vertical canes to just a few. As the canes grow overhead, a nice effect of several thin canes adjacent to a walkway is quite nice. See the photos below. This species can also be used in a small corner of a planting area or in a cut out planter as shown below. One of the planters shown is only about twelve inches in width and the Areca Palm is doing quite well (last photo). Some people like this species right up against their house or garage. It gives privacy and typically does not outgrow the height of the house. If you prune out some of the suckers, the volume of the plant doesn't overwhelm the house either. 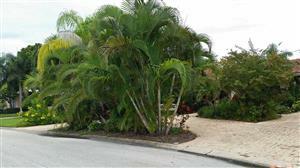 Below are several photos where the Areca palm is being used right up against a home. 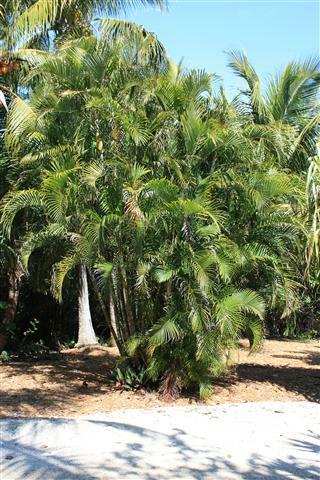 This species can be used in conjunction with other small to medium sized palm species. It is rare to see Dypsis lutescens planted all by itself in front of a home. As I accumulated photos for this article, such a photo was the hardest to locate. I think this is because such a solo planting is hardly ever done. Rather, this species is planted along with an array of other species to give a tropical effect. So, I might summarize by saying that the Areca Palm can be used as a stand alone specimen plant in the garden, but it would not be my first choice, looking better when planted with other palm species. I say this because it is not a large plant and not statuesque. 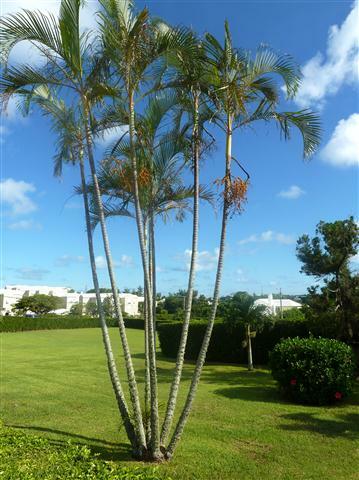 If one is to use only one species in the yard, I tend to like larger trunked palms with a good crown size. 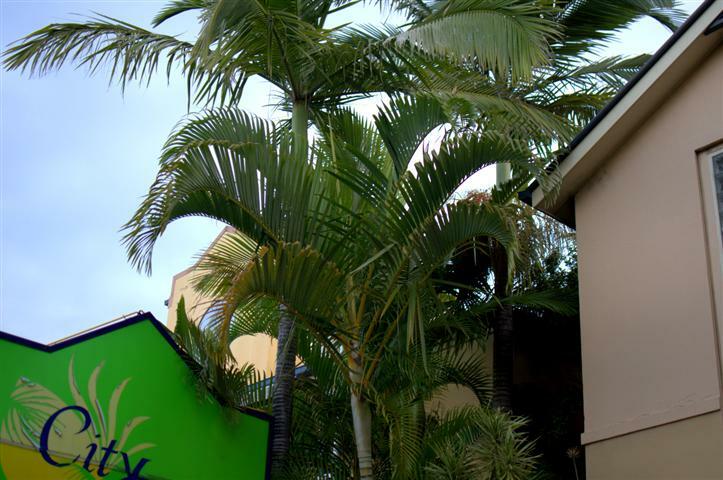 The first photo below shows how only utilizing the Areca palm leaves something to be desired. The second photo, where other companion plants are utilized, is much more aesthetic. 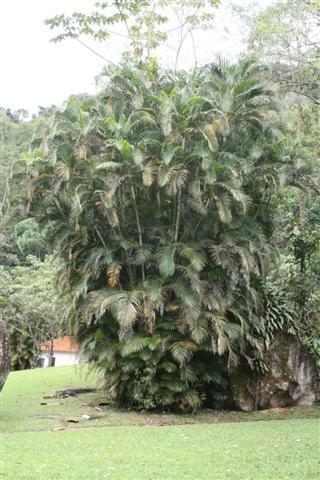 The third photo shows an unbelievably large Dypsis lutescens that doesn't look too bad in the front yard. Most specimens are not nearly this large. This is the most common way that this species is utilized in gardens out here in California. 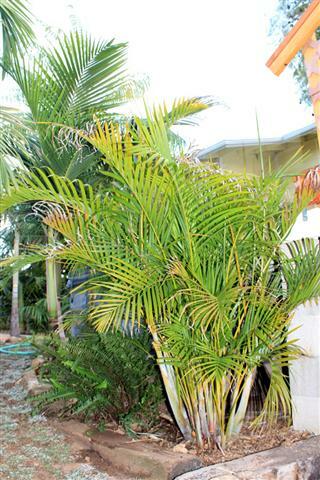 It is artistically mixed with a variety of other palms and companion plants. This could either be in the garden area per say or up against the house or fence. Mixed with plants of varying size and texture, it can be very appealing. 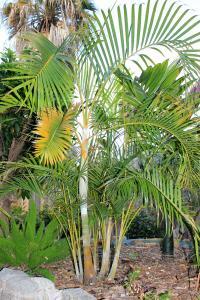 I especially like to mix in a few tropical fan palms to contrast with the feather palms. 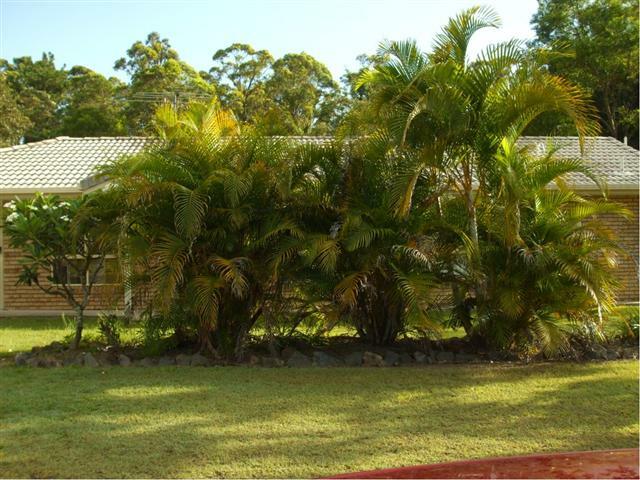 Photos shown below show how the Areca Palm is utilized along with other species in the garden. This species is quite easy to grow in a container. It likes good draining soil and regular watering. I've mentioned above the problem of brown tipping to the leaves that we see here in Southern California. This is typically seen in plants that are in full sun. A simple and quick "haircut" to the leaflet ends usually solves this problem and can make the plant look better in minutes. Often plants outgrow this condition over time. Plants in the garden are less likely to get this if they are given adequate water. Although I don't have a lot of photos of Areca palms in nice designer containers, I will supplement here with pictures of nursery grown containerized plants that will give you an idea of their appearance in pots. is used. This causes desiccation of the leaves and brown tipping. Also, this species does like ample sunlight. If you are going to attempt this, try spraying the leaves frequently with water mist and putting the plant near a bright window. 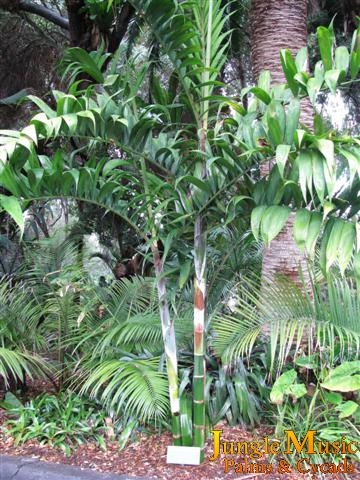 As a group, there are many suckering Dypsis species that don't get too tall. Many are ideal for garden planting. As plant enthusiasts like to try new species, I thought I'd show you here a few suckering Dypsis that are newer on the market and are not overly tall. All are suckering species with multiple stems. Stems on these are similar to the Areca, perhaps a bit thicker. Heights on these species range from ten to twenty feet. Most of these species can be grown in Southern California. I'll show mature or good sized plants to give you an idea what they will eventually look like. If you like Dypsis, there are a lot of very cool species to consider. At our nursery, we can give cultural advice as to the individual needs of all of these species. 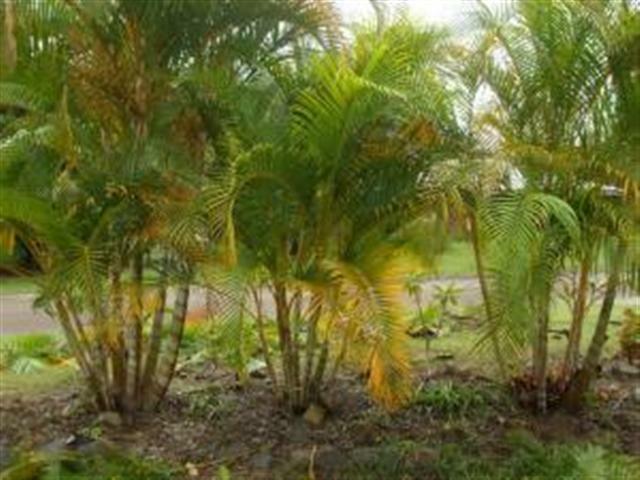 In this article I've discussed the popular medium sized suckering palm species, Dypsis lutesens. It is known as the Areca Palm, Golden Cane Palm and Butterfly Palm. This species does best in tropical areas but can also be grown in temperate climates. In topical areas or coastal temperate areas, it tolerates full sun and has some degree of cold hardiness. Variable characteristics of this species are overall height, number of trunks and color. There seems to be a form right for everyone. This species is quite adaptable and can be used in various applications in the garden. It can also be grown in containers but would not be a top choice for interior culture. Above, I also discussed alternative species of Dypsis that are excellent additions to the garden. All are different appearing. A large number of photographs have been used above to show the characteristics of this species. Thank you for reading this article. Feedback always appreciated. 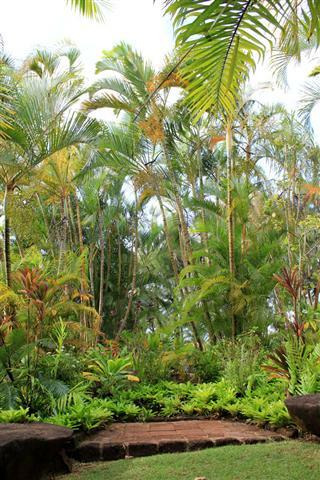 Check elsewhere at this site for over 5000 photographs and 50 articles on palms and cycads.